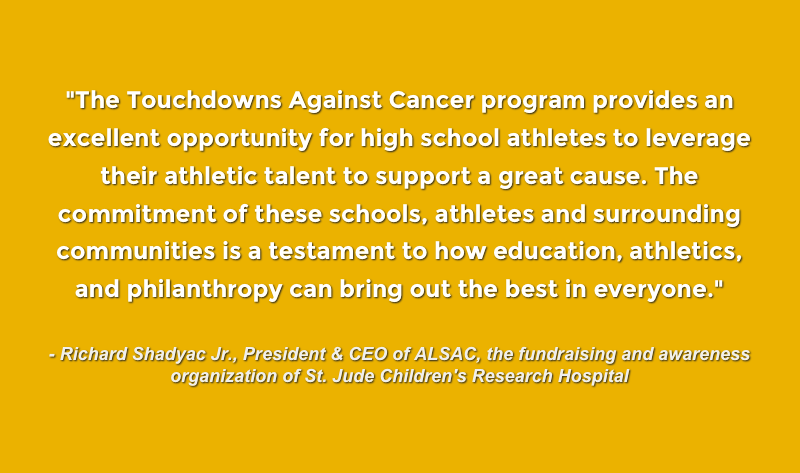 Touchdowns Against Cancer is a national fundraising program created in partnership between MaxPreps, Pledge It and St. Jude Children’s Research Hospital. Touchdowns Against Cancer unites high school football teams across the country for the benefit of St. Jude Children’s Research Hospital. The program creates a highly-engaging fundraising opportunity for high school athletes and their communities to raise money with every touchdown they score. St. Jude Children’s Research Hospital relies on a variety of fundraising programs and individual contributors to deliver the resources it needs to achieve its most vital mission— saving children, regardless of their families’ financial situations. With high school football, there was an opportunity to engage a market across the country that is passionate about its communities and its children. But how to match this nationwide passion with St. Jude’s most vital purpose? St. Jude, MaxPreps and Pledge It, partnered together to create the fundraising program and relied on Pledge It to provide its experience and expertise to create a fundraising platform tailored for high school sports and their communities. That’s why everyone who signed up to run their team’s page— known as a “campaign manager”— was assigned a dedicated “fundraising coach.” These coaches operated with the managers in a one-on-one fashion, offering advice, strategies, and how-tos, to ensure program success. They were also pointed to the program’s centralized website, where team success could be monitored via the “National Leaderboard.” The team on top of the leaderboard after each respective season was crowned that year’s High School National Champion, which triggered custom SWAG and in-person visits from St. Jude, Max Preps, and Pledge It, as well as a tour of the St. Jude Hospital and Research facility for the top fundraising team. Pledge It’s fundraising coaches recommended campaign managers encourage community members to sign up and support their team’s efforts as dedicated peer-to-peer fundraisers. Fundraisers, in turn, got their own web page that would track the progress of the pledges and donations that they personally recruited. From there, fundraisers could compete with friends and family for fun prizes and incentives on the Fundraiser Leaderboard, and gain the special feeling that only taking part in such philanthropic endeavors can deliver. Pledge It and St. Jude’s have extended this partnership through new programs, where they continue to reach out and touch different communities. Both sides are looking forward to the 2019 Touchdowns Against Cancer program, and beyond. Of course, Pledge It and St. Jude can only spread the message. It’s up to community members to run with it, and become active parts of the mission. Both organizations were thrilled by the engagement felt across the country.